Because Shanna Said So...: Is It Time To Accessorize Your Accessories? Are you always digging through a box, a drawer, closet or other random places looking for that bracelet, ring, other earring, scarf or your left shoe? That was me about a month ago. I was having my kids look under the bed for my other black boot while I was rummaging through a mess of stuff looking for my special necklace that I had to wear with my new stripe dress. By the time I found what I was looking for; my closet, bathroom and bedroom were destroyed. No more last minute scavenger hunts. I decided that it was time to get organized...I needed to accessorize my accessories! I thought I would share some easy, quick and inexpensive (or no cost) ways to get organized and to make your mornings much easier. Take a look! I found this bracelet tower at Sam Moon for $12.00! They have stores in Austin, Dallas and Houston. I was so excited! They had several to choose from in different finishes and designs. 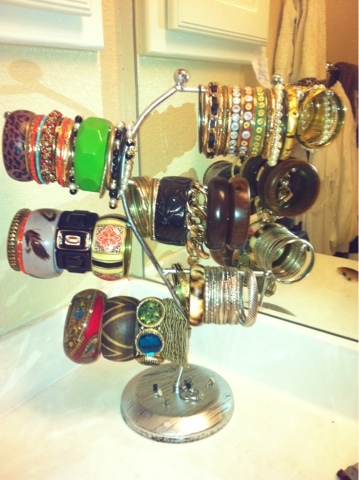 You can also use a paper towel holder for your bracelets, but this was a much easier way for me to arrange my bracelets. Here is the finished product...Wa-la! I found this idea on Pinterest. I always threw my knee boots in the corner of my closet and was always searching for the match. Then I ran across this idea and was like GENIUS! Why didn't I think of this before? DUH! This has been so helpful keeping my winter boots organized and easy to find...no more looking in the black holes...A.K.A. - underneath the bed or in my closet. They are all neatly placed on my closet rod with their own little special pant hangers. LOVE IT! Most of my lady friends know that I am an accessory freak! I have more Forever 21 necklaces than the store! It's a little out of control, I must finally admit. ;) So, I needed a way to organize them so I could stop the untangling madness! I got square cork boards at Target for $5.00. My sweet husband Ross, used liquid nails and glued them to the inside door of our linen closet in our bathroom. Tip: Double the cork boards up....two boards laid on top of each other. Like the song..."Stuck Like Glue" these cork boards are not going anywhere. Then I got fun colorful thumb tacks and hung my necklaces on them. Masterpiece...no more cuss words are being said trying to untangle the necklace madness. Oh, the little things in life. Here is a FREE and quick way to organize another winter accessory...scarves! Take a pant hanger and loop them over the long part of the hanger. I can fit like 6-7 scarves on the hanger. So much better than balling them up and throwing them in a drawer... you should have seen how I had them organized before...complete chaos! I am definitely getting organized now...yay me!! Have you ever thrown your favorite earring in the trash because you couldn't find the matching pair? Well, I have...numerous times...then I am cursing myself 2 months later when I finally found the match under my cabinet sink...seriously...how did that get there? So, I found this great little jewelry organizer at Stein Mart. I put all my rings and earrings in this nifty little hanger-upper. It fits nicely in my closet and is a girl's dream for earrings. They sell these everywhere now. Sam Moon has fun patterns with initials on them, Super affordable and a GREAT gift! I must say...mine isn't all the cute...but hey...it does the job! Last but not least, what the heck do you do with all your belts? Well, I got my hotty, jack of all trades husband to make a piece of wood with hooks attached to hang all my 50+ belts. Women say diamonds are a girl's best friend...well I really love my belts...best fashion accessory in my opinion...they make us all look slimmer! ;) Anyway, you don't have to have a man make this for you....go to Target, Wal-Mart or Bed Bath & Beyond and get yourself on of these. It's typically called a hat rack..hang it in your closets or the back of a door and I promise, you can fit a bunch of belts on these hooks. Why? Because Shanna Said So! Can you tell I LOVE my accessories and take good care of them? :) Cheers and Merry Christmas! !